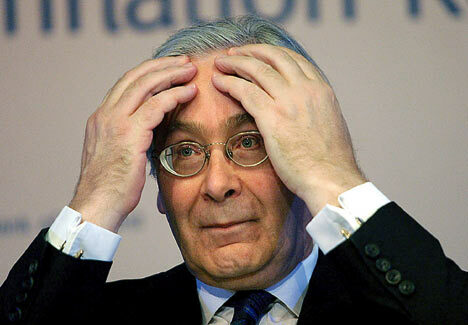 Mervyn King says the eurozone crisis remains a dangerous threat to the recovery of the UK economy. Announcing the findings of the Monetary Policy Committee's quarterly inflation report, governor of the Bank of England, Sir Mervyn King explained that the growth forecast has been cut from 1.2% for the year, to 0.8%, and that in ‘big picture’ terms, growth will remain slow. Not what everyone was hoping to hear, but at least the brain-boxes on Threadneedle Street aren’t predicting another few quarters of recession. In addition, King explained that inflation would now take at least two years to fall below 2%, despite having predicted just one year in the last forecast. In respect of this, it is worth noting that he did not rule out the possibility of more quantitative easing, despite the bank having opted against another round last week. But the recent fall in the value of Sterling suggests markets are still expecting more QE in due course. Explaining more fully the reasons for the forecast downgrade, Merv also cited the rising costs of global commodities and the resultant squeeze on people’s take-home pay, which in turn is a ‘dampener’ on consumption growth. Couple this with many banks becoming even tighter in their lending, thanks to the increased cost of funding amid a worsening eurozone crisis, and yes, you have a recipe for painstakingly slow growth. As the Greek parliament remains in a stalemate in trying to form a government, and therefore its European cousins face the prospect of watching a sovereign debt default drag the continent’s banks under, it is hardly surprising that Merv didn’t have better news. It remains to be seen whether the new Franco-German duo of Merkel and Hollande are capable of agreeing another solution for the crisis: we need it soon or our recovery may still be decades off.